MICK: I first became aware of Ambrosia when I heard "Nice Nice Very Nice" on the radio back in the mid 70's. It's always been one of my favorite songs. That was originally a poem by famed writer Kurt Vonnegut. How did you go about making that a song? deep into the character he was writing about. It was pretty mind opening! MICK: Did Ambrosia ever take another poem from another writer and make a song out of it? BURLEIGH: We were inspired by the e.e. cummings in "Somewhere I Have Never Traveled" and we wrote our own lyrics to it. We did steal the line! MICK: I know in the beginning you guys worked with Alan Parsons. What was that like working with him? BURLEIGH: It was amazing! He came over to the Grammy Awards for "The Dark Side of the Moon" and we had been in contact with him before that. He heard our rough stuff for our first album and he said he would love to mix it! During the course of mixing our first album, we recorded some tracks on his first album. It was a big secret as we weren't allowed to know what we were recording. The album was "The Tales of Mystery and Imagination". We did the opening track "The Raven" and he told us it was called "The Raver". They were afraid the secret of their album would get out! Alan is a great guy! He really opened us up sonically to what was possible. When you think rock and roll or pop, you think volume to some extent. I would come into the control room when he was mixing something and it would literally take me a few seconds to realize there was music playing because it was so soft. He would say "If I can hear music at that level, then I know it's fine". MICK: In Ambrosia, who were the principle songwriters? BURLEIGH: Everybody contributed on every song as everybody's input was vital. A lot of things would come out of jam sessions. I would say Joe Puerta and Dave Pack were like our Lennon and McCartney and I was kind of the George Harrison! 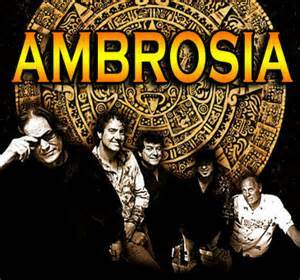 MICK: What is your favorite Ambrosia song? BURLEIGH: There's a lot of them but I would say one of my favorites is "Heart To Heart"[from the 3rd album "Life Beyond L.A."]. I love that song! MICK: Why did Dave Pack leave the band? BURLEIGH: In 1989 when Ambrosia reunited, Dave started to get a fair amount of producing jobs so he wasn't able to make a lot of the gigs. That was kind of leaving us in a lurch. There was starting to be a little seperation. So it just became a better situation to go on without him. We still really wanted to play. In a sense, Ambrosia was kind of unfinished business. We felt that we never really got the live statement out as much as we wanted to. Dave was not quite as eager to go out on tour. I think the road was a little harder on him than on us. Right now, I feel that Ambrosia is the best and as strong as it's ever been! MICK: Are you and Dave still friends? BURLEIGH: Yes I'd say we are friends. We have a relationship that's copasetic and understood and we are all good! MICK: Who is in the current Ambrosia? BURLEIGH: We have three of the original four members Joe Puerta, Chris North and myself. When we are a five piece band, it's Rick Cowling on keyboards and vocals and Doug Jackson on guitar and vocals. When we are a six piece, we add my wife Mary Harris to the mix. That's when we do most of our progressive music. That's mostly the first two albums for instance. MICK: Will you be coming with a six piece to the Suffolk Theater on April 18? BURLEIGH: No we will be a five piece for this show. It will probably be a combination show. We have our version of melodic progressive and we have the hits. Now it gels better than before. We can play "Mama Frog" in the same set as "How Much I Feel" where as in the 70s, it felt like mixing arsenic and peach! Now people seem to roll with everything a lot more now. We have fun mixing it up! MICK: For over 20 years, you and your wife have had a group called Tin Drum. How did that come about? BURLEIGH: When my wife and I found each other and got married, she was touring with Jimmy Buffett and flying around doing background sessions for Pink Floyd in "Animal Logic". I was doing a lot of drumming for other people like Dave Mason, Jim Messina and doing a lot of album projects. It got to be like we were handing our infant son off to each other in the airport. She would be leaving or I would be coming. It got to the point where we said "Hey, let's try to work together!" Otherwise we would be always passing each other in airports! So that was our effort to spend more time together and be creative together. After about three albums, we built a studio here and all of sudden we started producing other artists like Mighty Mo Rogers. Now we are making an effort to back recording with just the two of us again. MICK: Does Tin Drum ever perform outside of California? BURLEIGH: Yes we've played outside of California. It's not a heavy touring schedule but probably about 10 times a year we travel outside of oir community! MICK: As a drummer, which drummers do you admire? BURLEIGH: Gosh which drummers don't I admire! I do have my super influences like Elvin Jones. He changed my life. Jim Keltner was a profound influence. I see a kid playing thats only been playing for a month in a band and something he will do will knock me out. Anything and everything means something to me like the patter of rain or the rhythym of traffic. It's everywhere! I did a session last night with Bill Champlin from The Sons Of Champlin. I don't think I've ever seen so much talent in one person! He's not a drummer but he's a drummer! I had some valuable lessons last night! MICK: When you play The Suffolk Theater, will the band be signing autographs after the show? BURLEIGH: For sure! We will have our CDs and DVDs with us! 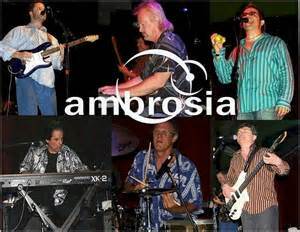 MICK: What's on the radar for Ambrosia? BURLEIGH: We just got off two cruises that were amazing! A progressive cruise and a more commercial cruise. We had the Moody Blues cruise and then we did the Yes cruise. They were both amazing! We want to do as much live playing as possible. We are trying to do a new record bit by bit. We also want to get out to some places that we haven't been to in a long time. We haven't been to Asia in a long time so we want to get over there. We want to develop Europe a little more and South America too. These are all on the wish list! We will continue to play a lot in the United States!